Fat reduction treatments are growing in popularity. As technology opens the door to nonsurgical fat reduction treatments, more people are willing to have their stubborn fat deposits removed. Through treatments such as ultrasound fat cavitation, busy consumers can simply walk into their favourite salons or clinics and receive advanced fat reduction treatments non-invasively, pain-free and without downtime. Ultrasound fat cavitation is a nonsurgical option to compliment weight loss. The technology targets circumferential fat and cellulite with ultrasound energy. The ultrasonic waves penetrate deep into the treatment area, creating vibrations that enlarge micro-bubbles in the fat cells. These microbubbles collide and implode, emulsifying fat cells. This fat then leaves the body through the natural filtration system, slimming and toning the treatment area. Fat cavitation can be used to eliminate fat deposits around the back, abdomen, thighs and buttocks. It also minimizes fat deposits along the upper arm to chisel the upper body. Body contouring treatments are quick, comfortable and are usually paired with skin tightening for an enhanced silhouette. 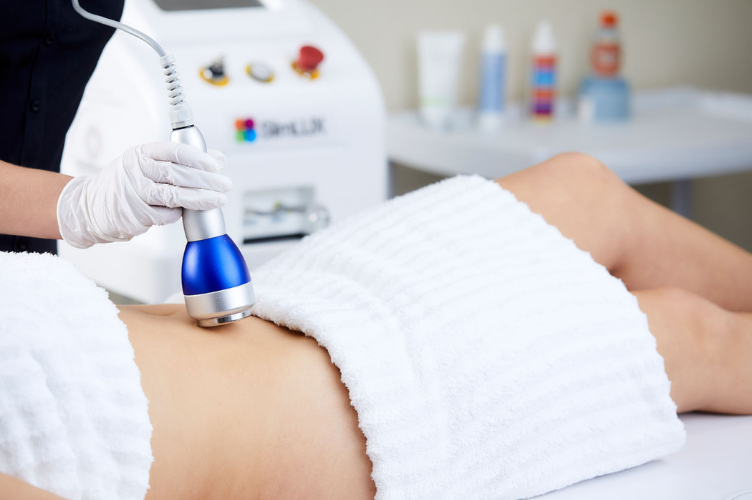 Why skin tightening after fat cavitation? As fat deposits are eliminated and love handles are reduced, the skin around the treatment area can sag quite noticeably. Fat deposits have an effect of stretching out the skin. Once they are removed, the skin tends to sag and fold. Sculpting and reshaping the figure is a dual action process that starts with fat cavitation and ends with skin tightening. This is why our body contouring machines come with additional radio frequency (RF) skin tightening capability to tone and tighten skin around the treated area. With RF skin tightening, radiofrequency energy is applied onto the treatment area, on the face or body, heating the skin to cause instant tissue retraction and skin tightening. The radiofrequency energy also stimulates fibroblasts in the epidermal layer of the skin to produce more collagen, plumping out and firming the skin where fat deposits were removed. RF skin tightening is painless, non-invasive and has no downtime. Maximum results around the area where fat was removed can be achieved after a course of 6 – 10 treatments.